Bangor, MI High School Viking – The Home of My "Big Things"
Well, this was quite some find. 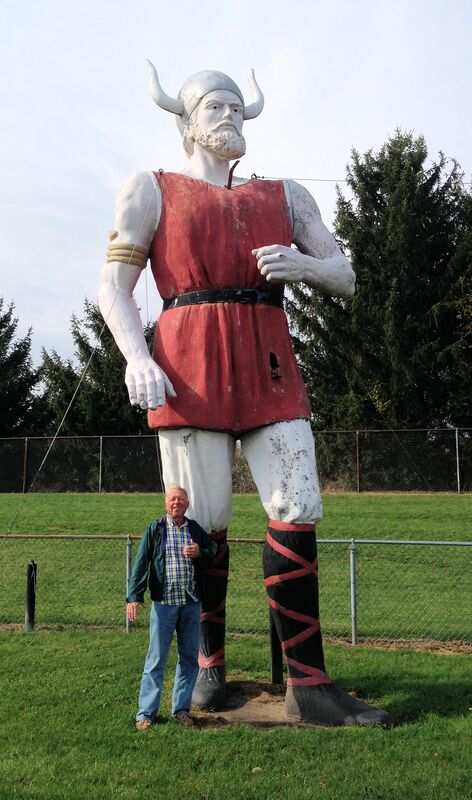 I knew about this Viking from a report on Roadside America. We found our way to Bangor, MI High School, only to find that this guy stood past the end zone of the football field. Unfortunately, there was a fence around the entire athletic complex. Not to be deterred I went into the school office and made my case. Fortunately, my plea fell on sympathetic ears. One of the administrative assistants was kind enough to find the keys to the field and walked out to allow us access to the field. My regret is that I did not write her name down assuming I would be able to remember it. Not so. If anyone sees this post and knows this woman please send me a note at “jim.hejl@jimsbigthings.com” Update: I did hear from the Superintendent of Bangor Public Schools, Dennis P. Paquette and he let me know the kindly person who walked us out to the field was Melissa Quinn, Assistant to the Athletic Director.